Here we will present one of the newest additions to the Tamiya family of M-05 Chassis cars. 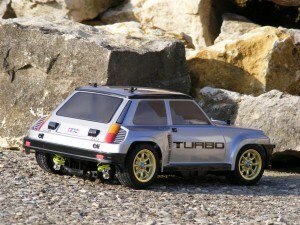 The Renault R5 Turbo. Tamiya enthusiasts and fans will know that this body isn’t really new, its only new for the M-chassis. This body first appeared in October 1981, shorty after the release of its german “brother”, the Volkswagen Golf Racing Group 2. At that time, both cars were based on the famous CS (Competition Special) chassis. Now its completely different. 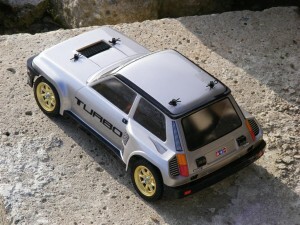 The R5 Turbo body now sits on the M-05Ra (Rally Layout) Chassis. 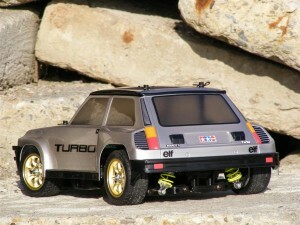 Back in 1981 and now too, Tamiya presented the body as a rally version. In this build I wanted to create a good looking street version of this famous car. This silver black version was one of my childhood dreams. Every day on my way back from school I saw one of the first R5 Turbos standing there in shiny silver metallic. Because of this the body sits on a “normal” M-05 chassis and not on the M-05Ra. But you can do a street version on the M-05 Ra too, as the M-05 Ra allows to set up the chassis to lower ground clearance. I only chose the “normal” M-05, because I had one lying around. The gold plated Mini Lite style wheels are the bonus parts of the Renault kit. I think they match the silver colour of the body really well. One of the biggest drawbacks of the old Renault body is the rear width. It is much too wide for the M-05 and doesn’t look really good. So I had to search for a solution to make the rear wider . You need nearly 1cm on each side. I tested various options. Tamiya TL-01 wide wheel axles – Tech Racing M-chassis wide rear axles. But that wasn’t enough. So I chose the simplest method to make the rear wider, Tamiya TL-01 rear upper and lower suspension arms. They are a direct fit to the M-05, you only need some slightly longer dampers on the rear for this modification, because of the longer lower arms and accordingly wider damper mounting points. I have used a set of leftover clear C.V.A. shocks from my M-05Pro chassis kit which I had replaced for Tamiya M-chassis aluminium shocks. Although this body is now 30 years old and counts as one of the first polycarbonate bodies from Tamiya it still looks good, especially compared to more modern bodies of other manufacturers. All in all a great new/old release. Enjoy this 80s classic! This entry was posted in Customized Builds on November 24, 2011 by dunebuggy. The Renault looks stuning and the proportions are spot on. You used suspension parts from the TL01. But what about driveshafts, also from TL01? The M-06 with it´s rear wheel drive would suit the Renault body more, but the body is impossible to mount on this chassis because of the rear mounted motor. And I call my self a Tamiya fan with a great knowledge of the brand and there rc cars. Yeah right!!! Hello, super nice job on the Renault. Just to be 100% sure … the body you used is from the new M05ra kit, right? How wide is it (front and back)? Also, if using tl–01 arms, the normal shaft must be to short. Which will then fit? Oh … just found the width, amazing 180 mm., perfect for longer arms and street/race/carpet version. I tried to find the body for sale separately, but for now it looks likes it is only available with the kit? 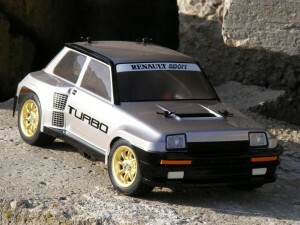 At the moment, the Renault body seems only available with the M-05Ra kit, which is a limited release kit. About the shafts, no other rear drive shafts are required. Because the M-05 chassis is Front Wheel Drive. You can use the standard rear M-05 uprights and wheel axles in combination with the TL-01 upper and lower arms. By showing only artisitic views of this car, Tamiya has probably tried to hide this problem of drivetrain width. This is quite un-professional, and your car proves how much this bodyshell would have deserved a better treatment. 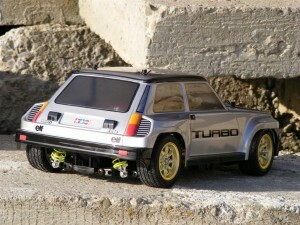 The one scale R5 Turbo is a real icon here in France, and lived a very long career in local rallyes; I hope young people can understand how much this car was stunning and a real schock at that time compared to ordinary R5s. They should have added some longer rear suspension arms in the kit from the start! You’ve done a great job in making it work now. The car looks stunning. 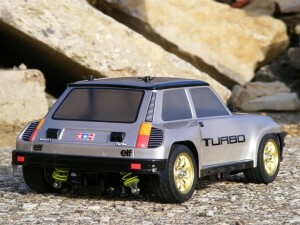 Hi, I have a body of R5turbo with chassis 4WD(ABC hobby) , but I must think the rear width, like you, then I arrived this page. 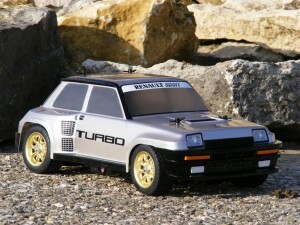 Yours , It’s the perfect style of R5turbo! I will do my R5turbo of Red.